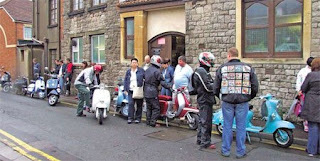 Now separated from Weston Scooter Parts, which Nigel sold to the Scooter Emporium in London, the museum is still however located in the same building. The first thing that struck me, despite the amount of visitors milling about, was the increased floor space one had to move around and look at the scooter exhibits. Yes it’s still cramped and of course not on the scale of London’s V&A museum for example, but a definite improvement on before. Next was how uncluttered the walls looked. Now the museum is no longer a scooter parts shop too you don’t have the excess of spares and accessories hanging from every available point around the place. While some may mourn the loss of the rare and (some) beautiful accessories hanging upon the walls from those days, their absence does allow one to appreciate the numerous advertising posters and other similar items now covering the wall space. Besides, you’ve always got the Isle of Wight rally for your fix of bolt-on chrome stuff. 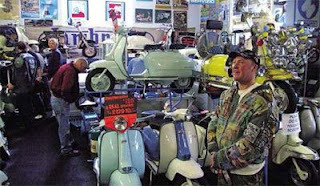 One major addition to the museum is Stuart’s business, Scooterproducts.com which will eventually move in, lock stock and barrel once the refurbishment has been completed. Certainly during the rally this seemed to work well with Stu and his team busy throughout the day as museum visitors searched for an ideal scooter related souvenir to take home with them. gw buat n jual kaos lukis.